“You are not breach mages yet,” Brama lectures as she paces down the line of students, her frail form belying her immense power. “Breach mages have protected us since the beginning — since the burning of the world and our pilgrimage into the dark. It was they who founded Gravehold, our last bastion, and if you wish to stand beside these living legends, you must listen and learn. The Nameless shall come again, as they always have, and you will need to be ready. You are the hope of our future.” As a young apprentice, you grew up to stories of the breach mages. Brama, the teacher, wisest of the mages. Dezmodia, the prodigy, master of great magic. Mist, the stoic leader and tactical genius. Malastar, the magical craftsman. Rebellious, powerful, and reckless perfectly sum up Xaxos. These..
You are head of a family in an Italian city-state, a city run by a weak and corrupt court. You need to manipulate, bluff and bribe your way to power. Your object is to destroy the influence of all the other families, forcing them into exile. Only one family will survive... 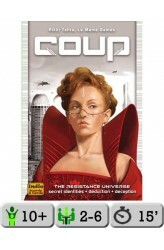 In Coup, you want to be the last player with influence in the game, with influence being represented by face-down character cards in your playing area. Each player starts the game with two coins and two influence – i.e., two face-down character cards; the fifteen card deck consists of three copies of five different characters, each with a unique set of powers: Duke: Take three coins from the treasury. Block someone from taking foreign aid. Assassin: Pay three coins and try to assassinate another ..
Coup: Reformation, an expansion for the original version of Coup: City State from La Mame Games, adds new cards to the game and rules for factions and team play that increases tension in the early stages for four or more players and (thanks to 15 additional character cards) allows Coup to be better played with up to ten players. 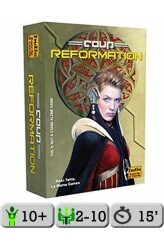 With Coup: Reformation, each player must declare himself either Catholic (Loyalist in the second edition) or Protestant (Resistance) and can target only members of the other faction. Conversion is possible, however, for yourself or for another player by paying a charitable donation to the Almshouse (Treasury). Like all factions, once you have eliminated or converted the other group, you just descend into in-fighting, so there's still only one winner an.. Flash Point: Fire Rescue - 2nd Story, an expansion pack for Flash Point: Fire Rescue, contains two double-sided mounted game boards and a counter sheet that contains ladders, windows, an explosion marker, and more. Each game board represents one floor of a building, and the player firefighters will need to cover more area in this expansion to keep things under control. Ladders and stairs provide access to the upper building level, and windows let firefighters enter and leave the building without causing structural damage. https://youtu.be/5jokIMRKEEw .. 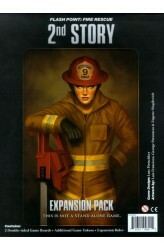 Flash Point: Fire Rescue - Extreme Danger – a boxed expansion pack for Flash Point: Fire Rescue – includes six different building configurations. When combined with the Flash Point: Fire Rescue - 2nd Story expansion, four additional building configurations can be created. In addition, it includes firefighter-specific miniatures (with colored bases), as well as tokens for explosive objects, hazardous equipment/chemical spills, and fire-proof doors. Also includes a box to hold all previous expansions. 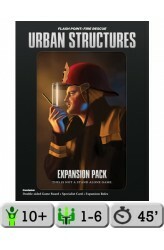 https://youtu.be/J17UvnLCubQ ..
Urban Structures is an expansion pack for Flash Point: Fire Rescue. 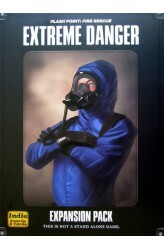 It is initially printed in low quantities in 2011 for supporters of the Kickstarter project for the base game. 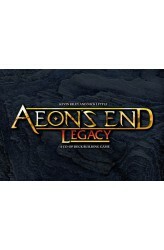 Subsequently, it is also available for pre-order from the publishers Indie Boards and Cards. https://www.youtube.com/watch?v=uz6wgxnE9cE .. The enchanted forest of the kodama is flourishing. But with so much growth, the ancient paths to the sanctuaries within have become overgrown and lost. Now the forest guardians call upon you, their loyal kodama, to restore these paths. Help your kodama build these paths, gather offerings for the guardians, and win their favor. 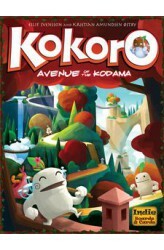 Kokoro is an exciting family game that can be played with up to six players (with a stretch goal to expand to more)! Each player has a forest map to draw their paths and turns are simultaneous so the game plays quickly. Connecting your sanctuaries to offerings will gain you favor. Choose wisely because you never know exactly when the sanctuary will score. 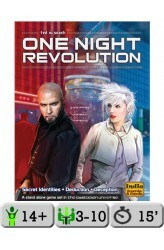 And you shouldn't be too greedy, if a sanctuary is not connected to more offerings than your previous..
One Night Revolution (formerly One Night Resistance) is a super fast game of secret identities for 3 to 10 players that combines all the deductive and chaotically fun elements of the One Night Ultimate Werewolf series with more structured game play. The result is a very addictive game that is easy to learn and will be played over and over again. Every player starts with a specialist role and an ID (either Government Informant or Rebel Fighter). At night the Informants reveal themselves to one another — assuming any exist, that is, as at all player counts between zero and three Informants are in play — then all players complete their specialist action in a clockwise order (removing the need for a rigid script/app and reducing the potential to accidenta.. The peaks of Snowdonia rise before you, encased in mist, their summits barely visible. The highest is Snowdon (Wyddfa) herself at 1,085 metres. The year is 1894, and the Snowdon Mountain Tramroad and Hotels Company Limited has been formed to build a branch line from Llanberis to the summit. You can scarcely believe it's possible! In Snowdonia players represent work gangs providing labour for the construction of the Snowdon Mountain Railway. Unlike other train games you will have to excavate your way up a mountain side, as well as make and lay the track, construct viaducts and stations. All this in competition with the weather of the Welsh mountains (and the game itself)! You may be assisted by a train (though that's not always best) and you'll be able to collect essential materi.. The Empire must fall. Our mission must succeed. By destroying their key bases, we will shatter Imperial strength and liberate our people. Yet spies have infiltrated our ranks, ready for sabotage. We must unmask them. In five nights we reshape destiny or die trying. We are the Resistance! The Resistance is a party game of social deduction. It is designed for five to ten players, lasts about 30 minutes, and has no player elimination. The Resistance is inspired by Mafia/Werewolf, yet it is unique in its core mechanics, which increase the resources for informed decisions, intensify player interaction, and eliminate player elimination. Players are either Resistance Operatives or Imperial Spies. For three to five rounds, they must depend on each other to carry out missi.. 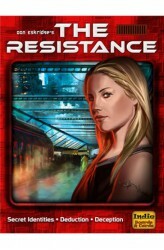 The Resistance: Avalon pits the forces of Good and Evil in a battle to control the future of civilization. Arthur represents the future of Britain, a promise of prosperity and honor, yet hidden among his brave warriors are Mordred's unscrupulous minions. These forces of evil are few in number but have knowledge of each other and remain hidden from all but one of Arthur's servants. Merlin alone knows the agents of evil, but he must speak of this only in riddles. If his true identity is discovered, all will be lost. 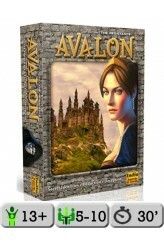 The Resistance: Avalon is a standalone game, and while The Resistance is not required to play, the games are compatible and can be combined. https://www.youtube.com/watch?v=MbL2uQYh66Q ..